Armed police have fired "specialist low impact rounds" to stop a car in Birmingham. 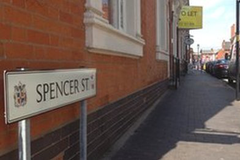 West Midlands Police tweeted that firearms officers had stopped the car in Spencer Street in the Jewellery Quarter by puncturing its tyres. Nobody was injured and two people are currently in police custody, a spokesperson added. Police said this was part of an ongoing operation and officers remained in the area.